Guaranteed Departures: This tour is carried out even if there is only one person on it! 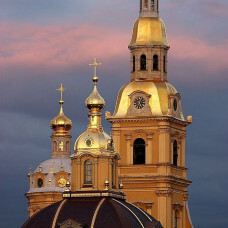 During our St. Petersburg group city tour you will find out a lot of about St. Petersburg history and culture. Our highly experienced guide will tell many interesting and amazing facts about St. Petersburg history, culture and lifestyle of Russian Emperors and people. You will walk around the Peter and Paul Fortress which was founded by Peter the Great in 1703 on small Hare Island in order to protect the city. Several photo stops will be made during the tour: at Our Savior on the Blood Cathedral, St. Isaac's Cathedral, Spit of the Basil Island, Peter and Paul Fortress. If you have any mobility restrictions, we recommend you to take a private tour. We guarantee that all of our tours will be arranged as scheduled subject to there being a minimum of 4 people booked on the tour. Please, be informed that all the tours must be booked in advance. If you are late for the tour or cannot find the guide, please, call us immediately at +7 967 513 26 80.